Purpose: Help to raise funds for use by the youth of St. Paul for mission trips, activities, and organized events. Collecting and gathering donated items priced and displayed in the CFC for the sale held the first Saturday in August. 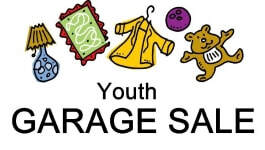 Regular Meeting Place & Time: Numerous organizational meetings, prep and collection work and sale day work as indicated in the church calendar and as scheduled by the Youth Minister.